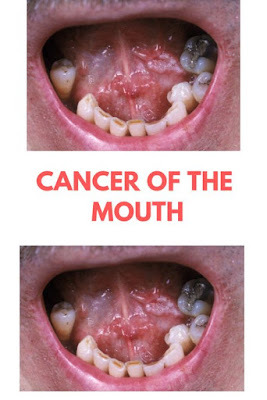 Cancer of the mouth is also called oral cancer. It is includes cancers that occur on the lips, tongue, cheeks, floor of the mouth, hard and soft palate that could get rid your smile away. Mouth cancer should be diagnose early and treat early or it could be life threatening. One-year survival rate of the oral cancer patients are 81%, while 5 years survival rate is 56% and 10 years survival rate is 41%. Men are two times higher risk than women are, and the greatest risk is men over 50 years old. Smokeless tobacco users such as snuffing, chewing, ad dipping tobacco is the highest risk factor with 50% likely to develop oral cancer, especially on the gums, cheek, and lip lining. The other common risk factors are smoking and excessive alcohol consumption with about six times higher than people whom do not smoking and not drinking. The other risk factors of cancer of the mouth are excessive exposure to the direct sunlight from early age, HPV (human papillomavirus) infection, and family history of cancer. In order to prevent oral cancer, avoiding the risk factors are imperative, especially avoiding smoking, drinking, and sun exposure. Using sun protection on the lips is recommended. Early detection will increase the chance to survive greatly. Understanding to the symptoms of cancer of the mouth becomes the first step to do. The symptoms are including development of white or red patches in the mouth, sudden bleeding in the mouth for no reason, sudden numbness and pain in mouth area for no reason, persistent sore in the mouth area that not heal after two weeks, difficult to chew, difficult to swallow, difficult to speak, and pain in the mouth area. Sometime, the symptoms may occur in the area surrounding mouth such as pain and sore in the throat, face, and neck. You can do self-exam to detect oral cancer early before you go to doctor for accurate diagnosis. You can do it by looking carefully at your mouth area using mirror and bright light. Check for possibility of patches and lumps on all surfaces, including floor of the mouth. Since some area may not visible, use your tongue to feel the lumps. The other early detection effort for cancer of the mouth is visiting dentist regularly.